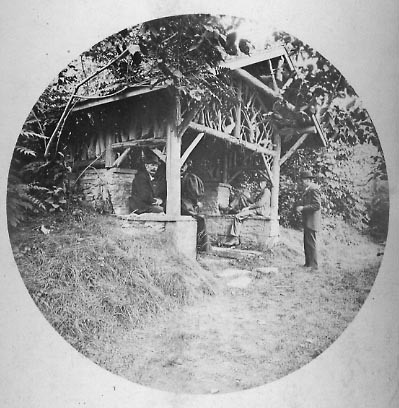 "Iron Spring near Middle Falls"
This mounted photograph shows what was known as the "Mineral Spring". Popular with tourists in the early years of the Park, it was located on the path to the Middle Falls from the Glen Iris Lawn. When the structure was built is unclear, but a map of the estate from the 1870's shows a spring in that location. What happened to the Spring? A story told by the wife of a former Park employee gives a possible explanation. According to this account, the famous spring water suddenly stopped flowing one day in the late 1930's or early 40's. Workmen were sent to see if they could restore the spring, and were surprised to find that the water had been coming from a pipe. When the pipe was traced it was discovered that the " mineral spring water" was actually the overflow from the fountain and fish pond near the Glen Iris Inn! The Spring and the little springhouse soon disappeared. Traces of the Mineral Spring can still be found along the Middle Falls path.